Now on its third reprint, Give Back Yoga Foundation’s bestselling practice guide Mindful Yoga Therapy For Veterans has earned the following words of praise from yoga instructors and from veterans. “What would you do with your life if you could get a break from the PTSD and Depression? Does your present situation have you stuck, making you unable to move on? Over the last several years I have come to realize there is no one thing that is going to work like a ‘cure’ for me. Instead, I look for ‘tools’ that help me along. I tried the medication route and it did help with acute problems, but I don’t see that as a long-term solution, only as one ‘tool.’ I used meds to make some progress – and I did make some progress. “I am an Iraq war veteran who works at a Veterans Administration Medical Center as a Peer Support Specialist. I suffer from PTSD, anxiety, panic attacks and I have a mild traumatic brain injury. 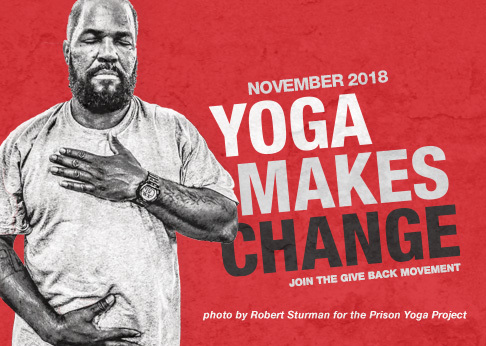 Before working here in December 2012, I found the Give Back Yoga website and received the Mindful Yoga Therapy for Veterans Recovering from Trauma book with CDs. That book helped me deal with my symptoms, and I found out that I like to do yoga and meditation – two things I never thought I would do. Now that I work here at the VA, I’m trying to help my fellow veterans gain the same relief and peace that I felt from this program. “(Before I discovered yoga), I had struggled for a really, really long time. I was angry, I was withdrawn, I was “right” all the time even when I was wrong. The first time I got on the mat, I got very emotional, and I knew that’s what I needed. I needed to open up and relieve some of that energy that I had been walking around with for the last 30 years. “What sets Mindful Yoga Therapy apart from most other practices is that it’s very accessible, and it’s designed to treat this beast that’s called PTSD. It’s very relaxing. It calms every part of your body. “My name is Sandra. I’ve been part of the Canadian Forces family for the past 26 years, including my husband Eric, children Sarah and Patrick. As any family in the military, we’ve gone through a lot of changes, emotional ups and downs, and worries. The first time I heard my husband was going on a mission for 6 months, I began feeling a lot of stress. We’d never gone through a separation for that long. I started reading books on how to cut stress out of my life. The information that I was looking for at the time is being given to you in the palm of your hands. The only thing you need to do is the practice. These techniques in Mindful Yoga Therapy are simple and powerful. For example: ‘Deep breathing sends a message to the brain that all is well and cuts the stress cycle.’ Wow, with the breathing practice I realized that I didn’t need to be in a relaxed atmosphere to reduce stress. It’s that simple. I started to take time every day even if I only had a minute to spare and say to myself ‘am I breathing in, and breathing out?’ Some days that is all I needed to feel calm again.